Is your Rabbit insured? Get a quote for up to £2,000 of vet fee cover |Insure up to 3 pets per policy | We’ve been insuring exotic pets since 1996 | Check out our customer reviews on Feefo. Can pet rabbits live outside in winter? Yes, they can. Rabbits have adaptations that help them survive the cold, such as thick fur coats and fur pads on their feet. Skip to: What temperature is too cold for rabbits | How to keep your rabbit warm in winter | How can I tell if my rabbit's too cold or too hot? | Can rabbits live outside all year round? Can rabbits be kept outside? Predators – pet bunnies aren’t as good at protecting themselves from predators as their wild ancestors. Rabbits are prey animals and are in danger of being attacked by cats, dogs, racoons, hawks or foxes. Escape – rabbits like to dig. So, if your bunny’s home is on top of soil or grass, and is not surrounded with mesh wire all around and under the level of the soil he or she might escape. Vegetation that’s poisonous to them – if allowed to run free in a garden or within a run that’s on vegetation, rabbits are certainly going to graze on whatever it is they find there. Look here for a list of vegetation poisonous to rabbits. The weather – special arrangements and structural additions may have to be made to your rabbit’s enclosure to ensure it will be protected from the elements. Rabbits do not handle extreme temperatures or wet weather well. Loneliness – outdoor rabbits often don’t get as much social interaction as indoor rabbits, especially if they don’t have a rabbit companion. 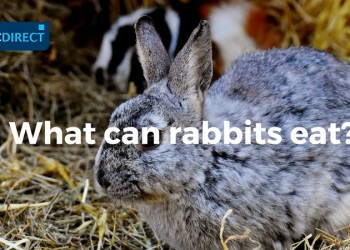 Although a lot of pet organisations and experts have started advocating only ever keeping pet rabbits indoors; keeping them outside isn’t impossible or unheard of. There are risks involved, but if you’re careful to avoid them, you can. You must be very careful and diligent in doing so. 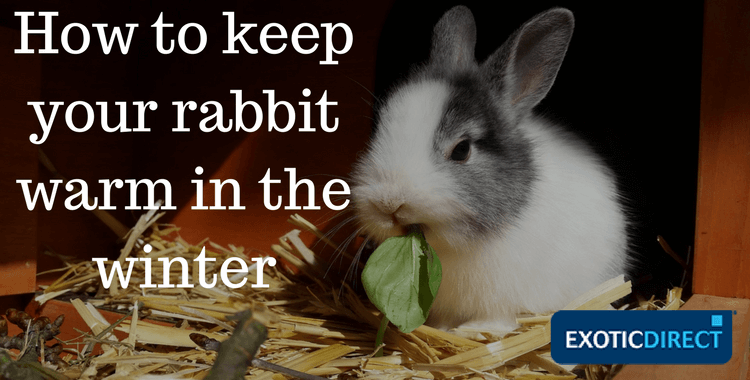 You must make sure your rabbit is in the right enclosure, has the right conditions and plenty of ways to regulate its body temperature if too cold or too hot. A spacious enclosure - Rabbits are very active and need plenty of space. Make sure your bunnies can comfortably stand on their hind legs in full stretch in their hutch, run around and make at least three full hops. Space for exercise that’s at least three times bigger than their hutch - Letting them roam around your garden freely is not recommended. Rabbits will nibble pretty much anything that comes their way, which means they might digest plants that are toxic to them. The list of those is quite long, but in case you want to bunny-proof your garden, avoid planting geranium, daffodils, aloe, hemlock and pretty much all plants that grow from bulbs. Note, this list is not exhaustive. Read more information about what food is poisonous to rabbits here. Safety from predators - Rabbits can die of fright. So, if your cat or dog decides to have a little play in the garden, your bunny can die purely at the sight of them. And think about other animals that might come into your garden, too; eg does the neighbour’s cat pay you occasional visits? Are there foxes in your area and if so, is it certain they can’t get in? Furthermore, is there any way for your rabbit to escape and go into your neighbour’s backyard? Keep their home dry, well-ventilated but never draughty - You might want to install roof panels or use a tarpaulin to protect their home from snow and rain and provide shade in the summer. Damp can make your rabbits sick and lead to insect infestations. Making sure their home isn’t directly on soil or grass and is slightly elevated above ground level might also be a good way to keep their home protected. If you have an outhouse, shed or garage in your garden, that’s not being used for anything else, it could make the best rabbit home. If you do, make sure that there is no electric wiring or vehicles stored in there. Rabbits can chew on electric cables or inhale fuel fumes, which could be fatal. Company and entertainment - bunnies are very social, intelligent and inquisitive creatures. Rabbits kept outdoors often get less human contact than indoor rabbits. It’s good to have more than one rabbit so they can keep each other company, but it’s also good to spend time with your bunnies. Whatever you do, don’t let them be lonely. 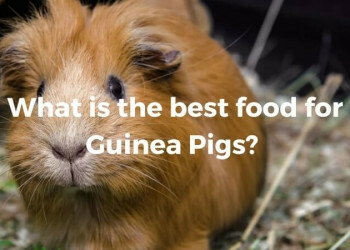 In addition, putting tunnels or huts for them to run through, providing various toys and being more creative with their haystack, eg: hanging feeders, beaker maze feeders, can be quite fun for them. 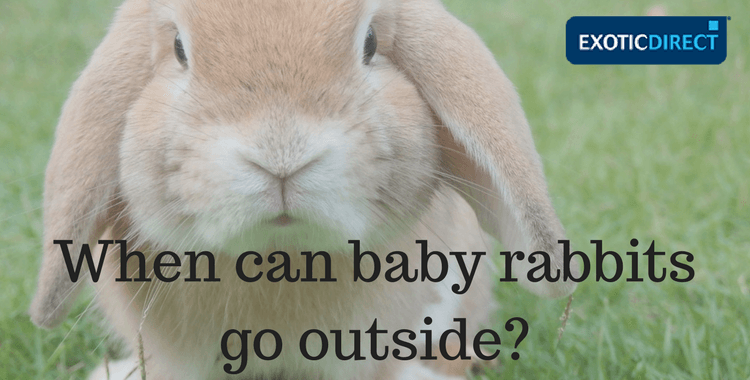 When can baby rabbits go outside? Different bunny owners and breeders recommend different ages. We’ve seen people say they let their baby rabbit out after two weeks, while others have said three months. The one prevailing thing among all of them, however, is the way they introduce their young rabbits to the outside. Firstly, you still need a run or a pen, where your rabbit will be safely enclosed and have enough space to roam around. Second, introduce the bunny to the outside gradually, begin with short 10- to 15-minute sessions. Some rabbit breeders recommend that if your bun has never had fresh grass before, you might want to bring in a few blades to your bunny before you let it outside. That way, it would be less likely to feast on grass when it sees it for the first time. Like with all things, bunnies need to be carefully introduced to new foods because eating too much at once can cause tummy problems. The best time of the year for a rabbit to go outside for the first time is spring when the temperatures are milder and more similar to indoors than they are in the swing of summer or depth of winter. And, always remember to provide plenty of hay! What temperature is too cold for rabbits? Anything under 10 degrees is likely to make your bunny crave for the warmth of some extra bedding. They can handle colder than that, too, but if your rabbit is older, he or she might suffer from painful arthritis and need to be kept warm and dry. If temperatures drop down to zero it might be best to move your rabbits indoors, or to a shed. If you choose to leave them outdoors, take extra effort to ensure their home is well protected from damp, wind, water and they have plenty of ways to keep warm. Face your rabbit’s hutch away from the prevailing wind and rain. Installing a sloped roof will help rainwater drain away. Make sure your rabbit’s home is raised off the floor enough to keep it dry. A weather-proof cover should be used to protect the hutch at night. Make sure to leave a small section uncovered for ventilation. During the day, put a clear cover over all but the front of the shed, providing it's facing away from the direction of the wind and rain. Provide a lot of extra bedding, this can be straw or hay, dust-free, on top of layers of newspaper to help keep the damp out. Don’t give them blankets as they might chew on them. Regularly check your rabbit’s hutch for leaks or damp and act if you see any. Bear in mind that wet bedding might freeze at night. Damp hay or straw could make your rabbit ill.
You can also buy microwavable heat pads made specifically to keep rabbits worm in the winter and put them under heaps of hay or straw. If your rabbit is in an outhouse, garage or a shed and you decide to use a heater to heat the space, make sure your bunnies are away from the cables and can’t get burned or overheated. Can rabbits live outside all year around? Yes, they can. In fact, outdoor rabbits grow a thicker coat in the winter and moult to make their coat thinner in the summer. Apart from that, however, keep in mind that they do not handle extreme temperatures well. You will need to make sure that their home is well-equipped for the cold months of the winter by providing adequate shelter and plenty of ways to keep warm. How hot is too hot for a rabbit? The best temperature for rabbits is between 10 to 21 degrees celsius. Any colder or hotter and your bun might struggle. 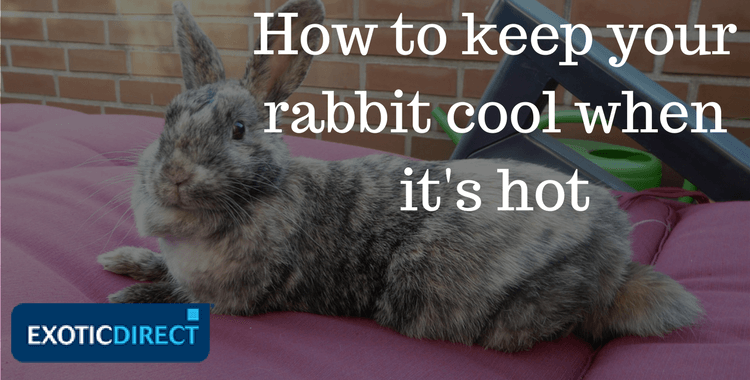 Rabbits sweat through their ears and that’s their only way to regulate their body temperature in the summer, so you need to make sure you provide plenty of ways for your rabbit to stay cool. 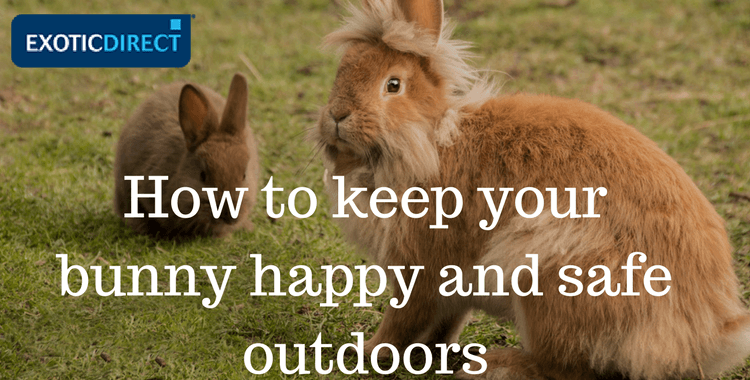 How to keep outdoor rabbits cool in the summer? Keep your buns away from the sun. Position the hutch in the shade and place a ceramic tile, or another cool material, inside for them to lie on. If your rabbit is too hot, you can spray some cool water on its ears from a very fine dispenser or rub a wet towel against them. Make sure he or she always has plenty of fresh water and feed him more vegetables as they are rich in water and will help prevent dehydration. In the hottest days, you can place ice cubes in a dish in their hutch and bottles of frozen water wrapped in a towel. You can also cover most of the hutch with a tarpaulin or any other water-proof cover and direct a stream of cold water towards it with a hose or sprinkler. The tarpaulin will allow the water to simply slide down and protect the hutch from getting wet. This will cool down your rabbit's hutch. How can I tell if my rabbit’s too hot or too cold? A rabbit that’s too hot is likely to have very hot ears and redness on the inner side of the ears. He or she might also appear to be panting and be slow and lethargic. A rabbit that’s too cold is likely to have cold ears. He or she might fluff up and lay on top of its legs instead of sprawling out. For a less stressful transition, consider moving your rabbit outdoors in the milder days of spring when the difference between the temperature inside and outside isn’t too stark. Make sure your bunny is warm by putting extra hay in his hutch for him to snuggle into, and covering the hutch with a blanket or a tarpaulin. Outdoor bunnies regulate their body heat by growing a thick coat for the winter and moulting in preparation for the hot months of summer. A pet rabbit that’s spent its life indoors will not have done that because indoor temperature is pretty constant. Similarly, if you only take your rabbit outside occasionally, it will not have enough time to regulate the thickness of its coat. ExoticDirect’s Rabbit insurance can cover £2000 of vet fees, dental included. 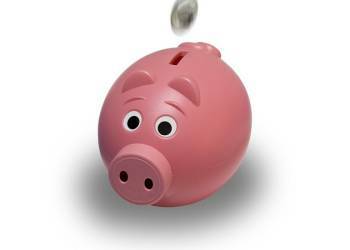 Get a quote now and find out more. Sign up for our FREE monthly newsletter full of interesting content! And it's spam free. What can rabbits eat? Hay, vegetables, fruit and water advice.